Elizabeth MacPhee has been working across the Australian Alps for two decades, and has a life long commitment to helping repair degraded ecosystems in the Alps. She is Rehabilitation Officer with the Department of Environment, Climate Change & Water, in NSW. 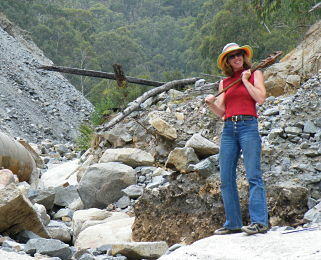 I work for the National Parks and Wildlife Service (NPWS) in NSW as Rehabilitation Officer for Kosciuszko National Park. I started working in the Australian Alps in 1990 in high altitude rehabilitation and plant production. I have an undergraduate degree in horticulture and a post graduate degree in ecology, focusing on alpine shrubs and their role in ecosystem repair. I have worked in a range of alpine and subalpine areas of Australia involved in rehabilitation, including ski runs, walking tracks, grazing damage, post fire repair and hydro electric schemes. I am passionate about protecting and restoring the Australian Alps and have been described as a rehabilitation juggernaut. – awarded a Churchill Fellowship in 2006 to look at high altitude rehabilitation techniques and travelled to Finland, France, USA, Chile and Argentina to do so. I have to live near mountains, my heart is in the Australian Alps – it is my spiritual home, when it suffers, I do. Anywhere in the Alps that has not been disturbed by white man in the last 200+ years – there are not too many places…..
To protect and restore the Australian Alps so that they remain ecologically viable and beautiful for generations of the future. To show all people that any ecosystems can be nurtured and restored to beauty if we chose to. Ecological destruction across the planet, the greed of man and the injustices that have been dealt out to many humans and all other living things in the pursuit of wealth. Professionally, the most joy I get from life is to take an eroding, weed infested, high altitude site in the Australian Alps and turning it into something beautiful, sustainable and habitable for other creatures as well as ourselves. My mother, Bob Brown, all the carers, not many…. I remind myself that biologically the human race is very successful. We have a big and varied gene pool to cope with a huge range of conditions, so do think we may hang in even if the ecology that we know today is radically impacted by climate change, lack of biodiversity, death of the oceans, or whatever else we seem to be heading towards. Humans are a great weed species and we are just as good as we are bad. It depends where you stand in the circle. Think I am slightly more pessimistic than optimistic, but see no point in sinking into the depths of despair. I want our society to change. I want us to re-evaluate our ethical basis to life and what we value. The planet Earth cannot sustain us in the manner that we in the west expect for much longer. We are part of nature and we seem to forget this and no matter what we believe in, nature will and does control us. We can chose to live with empathy and care for our life support system and each other or we can actively destroy it and each other. The Earth does not care and it will be fine. It can even cope with plastic and if you think about it, it is also natural….